What a great summer! No doldrums for us at Pardee RAND. 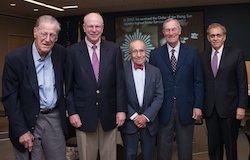 We began the summer celebrating founding dean Charles Wolf's 60th anniversary at RAND. You'll learn about the full span of Charles' remarkable contributions to RAND in the article below. Closer to the beginning of their careers are our newest alumni. We'll have ten new graduates by the time the summer wraps up, passing the 350 graduates mark. We welcome Susan Burkhauser and Jessica Yeats in this issue of Findings and are in the midst of the final flurry of dissertation defenses for the 2014-15 academic year. Our students are completing research on policy problems that include homelessness, school leadership, food security, special operations training, and the power of collaboration between teacher unions and school administration. I wish each of you could join the student and faculty members who attend these defenses so that you could see the remarkable quality of the work. One reason our students are taking on important policy problems is because of the role models they have in our alumni. Our alumni continue to be our favorite visitors to the school. And quite a few of you are getting national and international attention. Yılmaz Argüden recently addressed the United Nations General Assembly. Arthur Brooks and Samantha Ravich just released their latest books. And Jack Riley, Bruce Bennett, Jordan Fischbach, and Ruopeng An were all featured in national news publications. Congratulations! I can't highlight all of the great stories in this issue of Findings but I will use my last sentences to draw your attention to our story on Bringing Traditional Grains Back to the African Dinner Table. 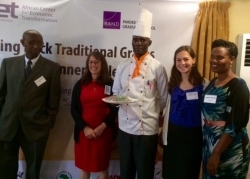 I'd bet you never imagined Pardee RAND co-sponsoring a recipe and cooking contest in Uganda. Be the Answer! His personal research has produced an impressive set of intellectual contributions to several fields and many critical issues of the time. His 14-year leadership of the RAND Economics Department not only shaped the cadre of economists and statisticians at RAND for a generation or two, but also enriched numerous other organizations where distinguished RAND alumni went on to serve. What he accomplished in 27 years as the founding dean of the Pardee RAND Graduate School makes him one of the intellectual founders of modern policy analysis and some of the institutions that go with it. And his philanthropy—the generosity of Charles and Theresa Wolf—is helping to ensure that RAND will thrive for years to come and is setting an example for all the rest of us. The analytic dexterity available at RAND continues to help shape students' policy tool belt this year, with more new courses and new faculty. Courses will be taught in multiple formats with professors and guest speakers across RAND locations. 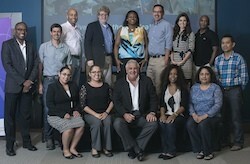 The U.S. Rebalance of Asia course will be open to all RAND staff. Full course descriptions of these new courses — and all of our courses — are available online. The Pardee RAND Graduate School held its third annual Summer Faculty Workshop in Policy Research and Analysis in the Santa Monica office during the week of July 20. The school hosted 12 guest faculty members from institutions serving highly diverse student bodies for an intensive introduction to policy analysis, RAND, and Pardee RAND. During the special keynote event on July 22, Assistant Dean Gery Ryan interviewed RAND trustee and chair of the Pardee RAND Board of Governors Pedro José ("Joe") Greer about his experience delivering medical care to underserved communities. Greer is also associate dean for community engagement at the Herbert Wertheim College of Medicine at Florida International University. The Pardee RAND organizers thank the workshop instructors, Sandy Berry, Lionel Galway, Gery Ryan, and Jeffrey Wasserman (cohort '85), and Pardee RAND teaching assistants Jeremy Boback (cohort '13), Annie Boustead (cohort '11), Beth Katz (cohort '10), and Yemi Okunogbe (cohort '13), along with more than 30 other members of the RAND community who helped make the event a resounding success. Alumni Sean O'Neill (cohort '06) and Ricardo Basurto-Davila (cohort '03) were also in attendance at the keynote event. As part of the Pardee Initiative on Global Human Progress, RAND, Pardee RAND, and alum Julius Gatune (cohort '01) of the African Centre for Economic Transformation (ACET) are collaborating on a project designed to explore whether it is possible to bring the traditional grains of millet and sorghum back to the Ugandan dinner table by improving their image and popularity through a nationwide recipe contest. Improving how people perceive traditional grains is important to maintaining and increasing their demand in rapidly changing food markets largely driven by urbanization. As the first step, a stakeholder meeting was held in Uganda in August to bring together government officials, chefs, nutritionists, media and other organizations interested in supporting this effort to raise the profile of these superfoods. RAND's role will be to design the contest and to develop pre- and post-contest surveys to assess the effectiveness of this effort. Student Michele Abbott (cohort '14) is helping to organize the project. Do you recognize the ad at right? 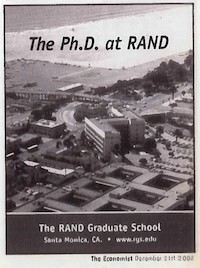 Is that how you were first introduced to RAND? We recently came across this gem of an advertisement from the Economist in December 2002. This year, we are offering in-person information sessions in our Santa Monica, Washington, Pittsburgh, and Boston offices, as well as two online sessions. We are also working out logistics for an information session in Mexico City. And rather than the Economist, we are using social media to spread the word. Of course, a personal recommendation goes a long way. If you know anyone who might be interested in a Pardee RAND Ph.D., encourage them to learn more at one of our information sessions or by visiting www.prgs.edu! A Pardee RAND trifecta that included student Shira Efron (cohort '11), alum Bradley Stein (cohort '97), and professors Ross Anthony and Daniel Egel coauthored the much-cited RAND report, The Costs of the Israeli-Palestinian Conflict. Pardee RAND student Brian Gordon (cohort '12) and professor Christopher Paul coauthored What Works Best When Building Partner Capacity in Challenging Contexts?, which examines the factors that can interfere with the success of building partner capacity efforts. Jonathan Wong (cohort '12) worked with RAND colleagues to develop two toolkits to help private-sector employers understand and to help veterans communicate the non-technical or "soft skills" that veterans bring to their private-sector jobs. Matthew Hoover (cohort '09) is now a data science fellow at Insight Data Science. David R. Johnson (cohort '08) is now assistant professor at Purdue University in the Industrial Engineering and Political Science departments. Bryce Mason (cohort '01) is now chief investment officer at Direct Lending Investments LLC. Brooke Stearns Lawson (cohort '05), a senior conflict advisor with the U.S. Agency for International Development's Africa Bureau, returned on June 4 to discuss with students how the Pardee RAND Ph.D. has influenced her life, career options, and path. She spoke about her current work focusing on transnational threats, in particular organized crime. She has more than 15 years of work experience in international development, relief, and reconstruction and co-authored The Development Response to Drug Trafficking in Africa: A Programming Guide. Meg Blume-Kohout (cohort '04) received her second contract award from the U.S. National Endowment for the Arts to evaluate and recommend updates for survey of public participation in the arts. Her company, MBK Analytics, issued a news release about the contract and research. Ruopeng An (cohort '08) was the lead author of Fast-food and full-service restaurant consumption and daily energy and nutrient intakes in US adults, in the European Journal of Clinical Nutrition. It was featured in scores of media outlets, including the Washington Post. Arthur Brooks (cohort '96) authored The Conservative Heart, which has received significant media coverage, including an interview on NPR's Diane Rehm Show. On the tenth anniversary of Hurricane Katrina, alumni Jordan Fischbach (cohort '04) and David R. Johnson (cohort '08), along with professor Kenneth Kuhn, wrote a paper on the Current and Future Flood Risk in Greater New Orleans. Samantha Ravich (cohort '92) edited the monograph Cyber-Enabled Economic Warfare: An Evolving Challenge; the book's launch was featured on C-SPAN. Bruce Bennett (cohort '75) wrote an op-ed about South Korean propaganda for the U.S. News & World Report, Words as Weapons. Jack Riley (cohort '88) authored Tunisia in the Crosshairs for U.S. News & World Report. Ken Thorpe (cohort '80) coauthored a commentary published by The Hill, At 50, Medicare's future looks healthier than before. Katia Vlachos-Dengler (cohort '98) wrote a blog post about her visit to Greece entitled Losing home. Susan Burkhauser (cohort '09); dissertation: Hello, Goodbye: Three Perspectives on Public School District Staff Turnover. Jessica Yeats (cohort '10); dissertation: Controlling Tuberculosis among High Risk Populations in Los Angeles: Three Essays. She is now an associate consultant at McKinsey & Company. As alumni, you know better than anyone the unique value of the Pardee RAND program, its students, faculty and initiatives, and the many other compelling reasons to give. Whatever your reason, please consider making your gift before the end of our fiscal year on September 28. Thank you! Additionally... as you know, globalizing is a critical part of RAND's vision and strategy, and we would love to have you be a part of that. RAND International is interested in connecting with you as we develop our profile and portfolio. If you are interested in participating, to be a part of connecting RAND to policymakers in your country or region, please send a note to prgs-alumni-news@rand.org. Dean Marquis will be hosting dinner for alumni in Boston on September 10 and would like to invite you to join her for dinner if you will be in town. Location is being finalized, and will be confirmed shortly. Christine Eibner, a RAND senior economist and Pardee RAND professor, will discuss the Affordable Care Act. It will be a fascinating evening, and we hope to see you there. September 18: Alumni/New Student Happy Hour in Santa Monica, 5 - 7 p.m.
Save the date for this upcoming event! We're looking forward to you meeting the new Pardee RAND cohort, to learn about the new students and to share your expertise and insights with them! The program will include a happy hour with food, drinks and lots of great conversations. An invitation will be sent shortly.